* There are, as the man said, known unknowns. And I've always thought my fellow Corkman, Roy Maurice Keane, falls into that category. Endless think-pieces have been devoted to fathoming the depths of the man from Mayfield, so familiar and yet so hard to know. Is he a riddle, wrapped in a mystery inside an enigma? Or just a contrary bollix? "What do mean; 'I'm a little freaked out right now?'" 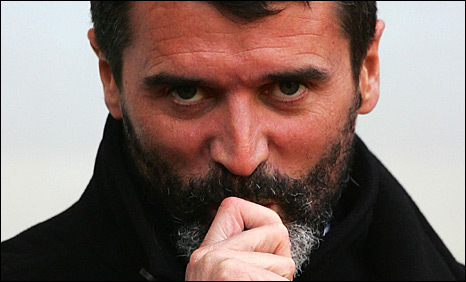 * So Roy Keane is back in the news....he's hardly ever out of it, to be fair. The man has that strange quality of kicking up a whirlwind all around him, while remaining detached and cool in the eye of it. Wherever he goes, whatever he does, he fascinates, provokes, angers, enthralls. You may be rolling your eyes at this stage, you're fully entitled to. But don't deny that there's a charisma in there, an attitude, something of the spirit of the song written by Welsh band Super Furry Animals about another footballer, The Man Don't Give a F**k.
Except, of course, he does. And that's part of the attraction and part of Roy's problem, the intensity. Other footballers would have gone to a pre-World Cup training camp, organised in a traditionally shambollocky fashion by the Football Association of Ireland and said "sure we'll be fine, now where's the bar?" Roy took one look at the facilities, the slack attitude, the failing to prepare and blew a gasket, blowing up his best chance to shine on the world stage as part of a fairly decent Irish World Cup squad. Back in 2002, with Saipan and all that (don't worry, I won't be mentioning Second Civil Wars) I found myself in the weird position, as a Corkman living in Dublin and working in the media, of having to defend Roy in various settings, radio studios and pubs mostly. All it took was one sentence in a mellifluous Cork accent and irate taxi drivers would be screaming about "THAT BOLLIX KEANE!". People would shout at me in pubs. It was weird. And fun. I'm from Cork, we like that sort of thing. Then I went to Japan and Korea and spent three weeks being shouted at by guys in green jerseys. And the odd travel agent. Good times! And now Roy is agitating the nation once again, with strong rumours that he is about to "walk out" of the Irish set up and take over at Celtic. Well, for the record, I've always liked and admired Roy - except when I haven't - and I think I know a bit about where he's coming from...which is...of course... Cork. To understand Roy, you have to understand that he is from a city that's always been semi-detached from the rest of the Republic. A port-city all alone on the south coast that has always looked outwards, always gone it's own way and always felt that we don't really have a lot in common with the Dubs. Or anywhere else, to be fair. Cork City people don't even feel a hell of a lot of affinity with North or West Cork. They're nice people, like, quaint country folk with weird accents. Cork has always liked a charismatic man. It is, perhaps, the only city in the world where a Male Model (Perkin Warbeck) could start a rebellion (true story, I'll write about it some other time). We're prone to being taken in by flash, by arrogance, by a bit of the devil. You can be a ferocious langer but if you've got a lovely singing voice, or a way with a story, we'll love you for it. We are fools, sometimes. And Cork has specialised in producing chippy, I'll-Do-It-My-Way types. You say black, we say white. Tell Michael Collins you can't fight an empire with four guys behind a ditch, and he'll do it just to spite you. (look, there was no way I was going to get through this NOT mentioning Michael Collins. If it wasn't for him, you'd all be speaking English). And Roy is from the outside part of the Outside City. He's a northsider, which in Cork is (or maybe was) a bit like being Children of a Lesser God, still angels, because you are from Cork, like. Just not as angelic as they more refined folk on the southside. He's also very working class (we don't like to talk about class in Ireland, but it's there) which means he would not have that bred-to-success quality imbued at birth and through expensive education in some of our Rugby stars. That natural ease. And he was a classic late developer, told, from a very young age, that he was too small, too slight, too Cork to make it. He got an early knock-back from the Republic of Ireland youth set up (the Dubs, natch. the feckers, never forgotten) and only made it over to England in his late teens after he sat down and wrote to practically every club in the four leagues begging them for a trial. 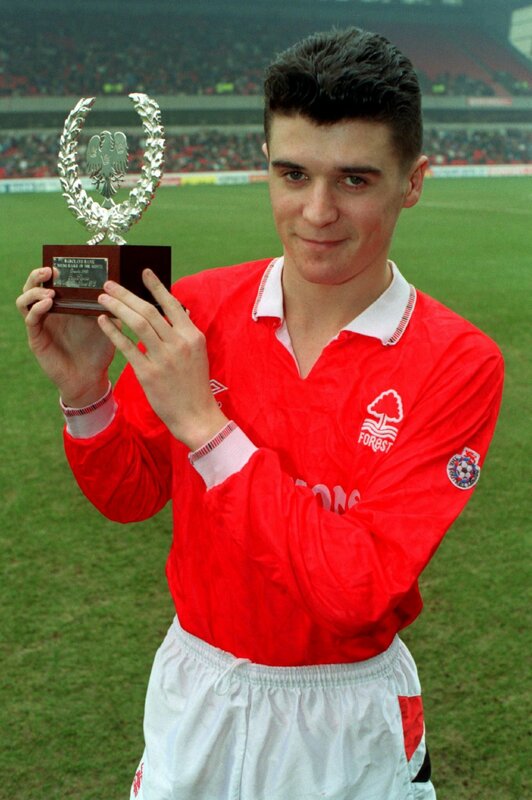 It took a maverick in Brian Clough to take a punt on the maverick kid from Mayfield. So - add the early discouragement, the rejection, the feeling of not getting a fair chance to the already nuclear levels of chippiness in the Cork mentality - plus Roy's intense nature - and you get some idea of why Roy is as he is today. Ah Roy, How Can We Stay Mad With You? Which is not to say that everything the man does is right, or smart, or brilliant. What fascinates me is the single-minded, intense need to go his own way, to constantly push himself and those around him, never to settle or take the easy option. He took what could have been a very destructive force within him (and as he has said himself, he had his issues with alcohol in his younger days) and turned it outwards, made it work for him in a way that many Irishmen, famous or not, have not managed to do. Many of us (Irishmen, that is) internalise anger, disappointment, frustration. Some self-medicate, others spend much of their lives suppressing the urge to shout in the faces of the feckers who are making this life way, way to hard. But outwardly, we do the cool as a breeze, lads! thing. Roy gives vent to the anger. Which must make sharing a dressing room with him a laugh and a half. And one more thing that tends to get overlooked with Roy. He's got a great, sly sense of humour, a sense of the absurd (very Cork) and a self-deprecating (and self-knowing) approach to dealing with the business and the media. He's well aware of the Mad Roy With The Crazy Staring Eyes perception of him and if you look closely at press conferences etc, he has a lot of fun with it. We're a bit weird about our Sporting Heroes, we want them to excite but conform at the same time. We love it when they transgress and do the things we mere mortals can't do - such as tell the boss/world to F**k Off - but pull them up for doing so. But ask yourself this. Do you want a window on Roy's World or, say, the World of Alan Shearer? Shine on, you crazy diamond, Roy. And always remember to keep it Cork. Joe an excellent read ! Well written excellent article. Despite not being the biggest fan of his, you tried to show us a picture of why roy was and still is a complex successful individual. However, I still think Roy turned his back on his country. He surely would have before Saipan been in similar conditions with irish training facilities took yet took that moment to get fired up, leaving us without a great footballer for the World Cup. We aren't England and have bags of money behind us so he was fully aware we might not get everything we needed. But it's about football, and making the best if what you have, it was beneath him at the time and I'm sure in hindsight he regrets it. He made himself a villain so to speak and when all this started about him leaving I wasn't surprised. His failure to go to Celtic is one of predictability. He knows he's not got enough experience at management level and is better to stay with ireland. I admire his ambition but not so keen on his actions at times. Again I enjoyed the read but it's not a cork thing, I love cork but sometimes it's need to be superior is trying.